The simple way to make duck is to roast it in the oven exactly like the roast chicken from May 27th, except longer, much longer… and even then my last duck was not tender. So unless you are cooking magrets de canard from Brome, Québec, I suggest to go through all the trouble below. It is a lot and you might as well make two ducks at once which should give enough for eight. It takes a while, so better start in the morning. With a good sharp knife, carve the legs and breasts off two Canada grade A ducks. Boil everything else in the pressure cooker for 40 minutes to make about 3 to 4 cups of broth. In a very large cocotte , brown the eight pieces of duck well, then add a clove garlic, two shallots, half an onion, a small bayleaf, thyme, one clove whole or a pinch of powder, the broth you just made and the juice from a can of red cherries. Simmer gently for 90 minutes, covering when the liquid is down to the meat level. At the 60 minute mark add eight small turnips, eight beets, 16 nugget potatoes, the cherries, and diced pine mushrooms (Matsutake) if you can find them or shiitake. Now is the time to remove everything from the cocotte so that you can transfer the broth into a container. Put this in the freezer until the fat has risen to the top in a paste that you can remove. To finish, put the duck and vegetables back in the cocotte with a small piece of butter and a spoon of olive oil. In another pot, add 1/2 tsp flour, 1tsp Dijon mustard, 1 tbsp balsamic to the broth and reduce to about 30cl of jus. Serve the duck and vegetables on a hot plate with 3 tbsp of jus on the meat. A red Burgundy or any Pinot noir goes well with the duck. 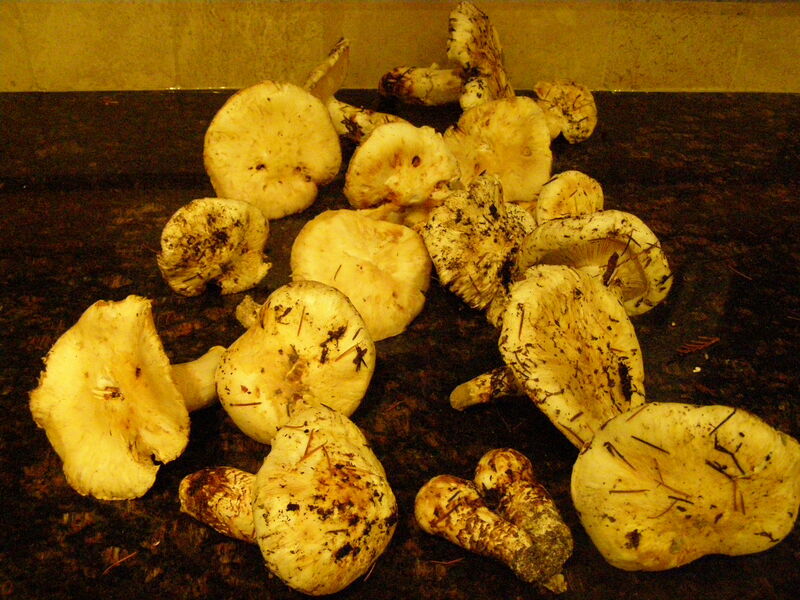 Matsutake : is the Japanese name of the pine mushroom or Tricholoma matsutake. We are lucky to be able to pick them ourselves on Vancouver island. 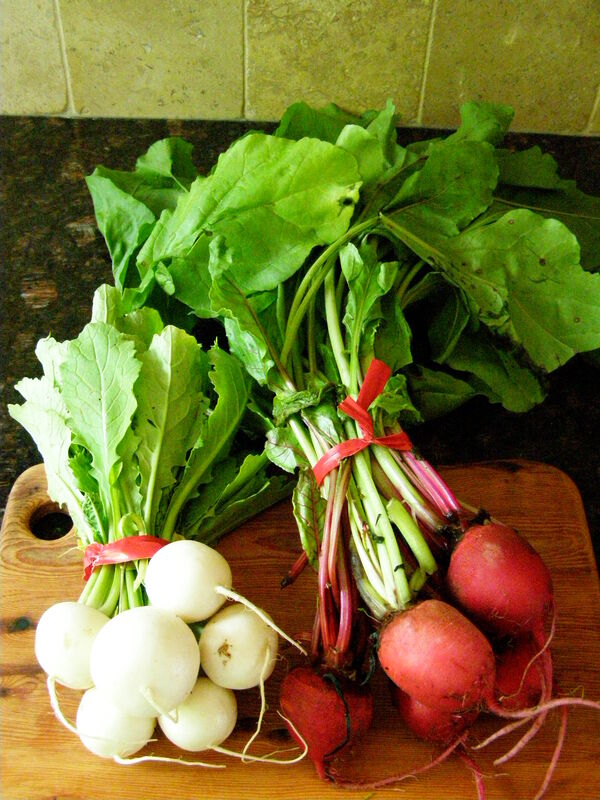 See last fall’s harvest. The pine mushrooms grow under coniferous trees, Douglas firs and pines and have their distinctive resin taste and smell, a little bit like Retsina wine from Greece which was stored in amphorae sealed with pine resin. This entry was posted in Main Course and tagged cooking, duck, duck fat, food, jus, matsutake, pine mushroom, recipe, recipes. Bookmark the permalink. I cooked a duck only once in my life….probably 30 years ago when I was with my ex. I thought we should try one out…and barely found enough meat on it for the two of us…and was glad we had not invited another couple over. I have had duck many times since…but professionally prepared in restaurants, including Tour d’Argent. But Brome duck is one of my favorites…use to have it at the Auberge Hatley in the Eastern Townships of Quebec. Yum! I would love to try those matsutake mushrooms..the taste you describe of the fir trees sounds very interesting. Reading about all these wonderful dishes leaves me feeling satisfied…without the calories! But I would much rather gobble all of this down.